When it comes to being globally gorgeous, products that do good for you and humanity demonstrate genuine beauty inside and out. For this reason we were doubly-excited when Nomad Two Worlds launched three new fragrances in its “Raw Spirit” collection. These products validate their new commitment, alongside renowned fragrance house Firmenich, to the Clinton Global Initiative (CGI). Over the next two years, these socially-conscious brands plan to introduce ten new Raw Spirit fragrances while working to identify and support indigenous and marginalized communities in Haiti, the Amazon, Australia and the US. 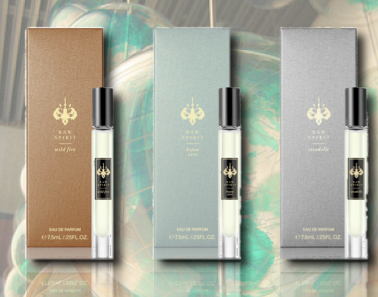 The latest fragrances, “Bijou Vert” and “Citadelle” focus on premium Haitian sourced vetiver. Do your part while you engage in your natural beauty behavior because part of the proceeds will be used to support sustainable Haitian agricultural projects. “Bijou Vert” (“Green Jewel”) is an elegant and refreshing twist on the classic vetiver fragrance, featuring premium Haitian sourced vetiver, grapefruit, mandarin, geranium, lotus flower, black pepper, benzoin, patchouli and cedarwood. “Citadelle” represents the strength and resilience and spirit of the Haitian people. Premium Haitian vetiver mingles with marigold, pear, bergamot, lemon, spices, amberwood, musk and cedarwood. “Wild Fire” is inspired by the intoxicating scent of the West Australian desert is a warm, sensual fragrance combining the rich dry scent of Australian sandalwood with the creamy amber and floral notes of ylang ylang, jasmine petals, cedarwood and musk.